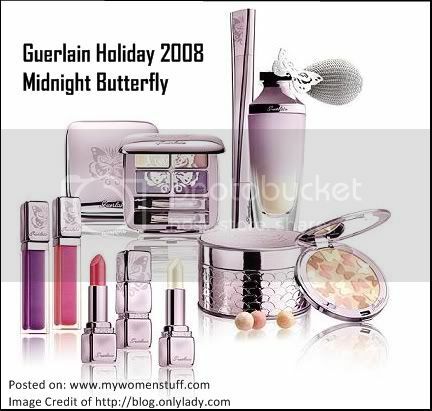 The theme is Midnight Butterfly and there will be butterflies etched on the limited edition products and on its packaging. I don’t know how anyone will be able to resist it! Just look at this picture of the items in this collection! I found this online at blog.onlylady.com which is a Chinese article and therefore I cannot read it. I’m still waiting for the official information to come in if I can get it. Otherwise, we’ll just have to wait till we see it in the stores. Left to me, I’d get that red Kiss Kiss lipstick and maybe the rose coloured lip gloss. There looks to be a special limited edition release of the Meteorites powder in loose ball form and pressed form with butterflies on it! The colour looks to be a light illuminating beige tone though. I’m not sure if I’d go for it. The eyeshadow palette though pretty makes me a little wary because I’m not good with purple eyeshadows. I also wonder what the Le 2 Mascara is doing in there? Is it a purple mascara? And isn’t the perfume with the atomizer cute? I think butterflies are a strange theme for Christmas or the end of year Holiday period which tends usually to be wintry and shimmery. Butterflies are like Spring! I MAY have no choice but to get the meteorites and the perfume. I love butterflies. No choice. I can’t wait for this collection!! Of course I get excited about any Guerlain Collection. lol. I believe the item you mentioned that looks like perfume might be like the gold dusting powder that Guerlain put out last holiday. I also think the mascara may be purple since the Le 2 de Guerlain mascara already comes in violet. Thanks for the post!! Love your blog!! @Elvira : Thanks for the clarification about that perfume bottle looking thing and thanks for visiting! I can’t wait to see this collection myself.